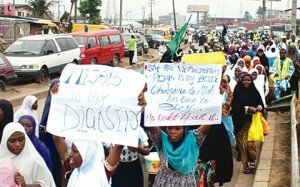 Muslim pupils under the umbrella body of the Muslim Students’ Society of Nigeria marched through some major streets in Lagos State on Saturday, protesting against the hijab ban in public schools. The procession was peaceful and many of protesters were seen carrying placards with various inscriptions. Some of the placards condemned acts of immorality, while others encouraged the wearing of hijab by female Muslims. The Amirah (Female President) of the Lagos unit of the association said the association might seek legal action to claim Muslims’ rights. Speaking with SUNDAY PUNCH, she called on the Governor of Lagos State, Babatunde Fashola, to allow female Muslim students in public schools wear hijab. She cited the case of Ekiti State where the Governor, Kayode Fayemi, has permitted such, asking why Fashola, a Muslim, should not emulate Fayemi. She stated that it was their right to wear hijab. The procession was made up of mainly girls of primary and secondary schools. They marched from Maryland to Gani Fawehinmi Park, Ojota. World Hijab Day is celebrated on February 1. It was started by a New York resident, Nazma Khan.